I’m not the only one that thinks so. 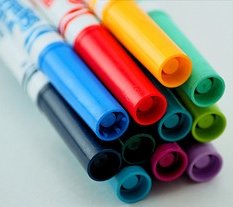 Children at Sun Valley elementary school in San Rafael, Calif., have been promoting an online petition aimed at nudging Crayola, a subsidiary of Hallmark, into developing a "take-back" program for used-up markers. So far the petition on Change.org has more than 60,000 signatures. "I don't think they thought they were going to get there so quickly," said Sun Valley Principle Julie Harris, "They were hoping the Crayola company would take notice of it." Crayola has taken notice, but spokeswoman Stacy Gabrielle said that while the crayon maker encourages "children to share their ideas," the company has no plans to offer a recycling program for its markers. She also said Crayola does not have "the facilities or a process" for a recycling program, but added that the markers' caps can be recycled at facilities that take that type of plastic. She also said because of the contents of the markers, the company doesn't recommend recycling them. "Because only the marker plastic is recyclable, not the ink reservoir or the tip, we do not recommend that consumers recycle the markers themselves," she said, "It would require the removal of the nib and reservoir which could create small parts, a choking hazard to small children." She added that Crayola is, "very committed to doing our part to take care of the environment." Crayola uses solar energy to manufacture about 1 billion of the 3 billion crayons it makes each year and its markers are made with recycled plastic. The children are not going to give up, however. They love Crayola markers, but they also want to stay green. Maybe in the future, Crayola will find a way to make their markers easy to recycle.